So, what’s new, you ask? Well I’m glad you did ask – because as it happens, there is new. That is, there is news. The news being Free Fiction (yanno, since everyone loves freebies) Although there’s gonna be a catch this time. What do you mean, you ask? Well, it’s like this . . . Starting in December, on the first Friday of the month, you’ll all be treated to my new novel, Ether, a chapter at a time. I’ll be posting one chapter of Ether, every Friday, until it’s completed. As there are 23 chapters, you’ll have read the entire novel by sometime around May. God bless blogs, I’ll have the entire novel set up to automatically post the next chapter in line, every Friday, so even if I come down with some sort of plague, nothing will get skipped. BUT – if you don’t like to wait, you can purchase Ether as a trade paperback, or an ebook to read at your own pace. By the time everyone else is reading chapter 3 for free, you could have finished the entire novel and given it as a Christmas gift. When and where can I get a copy? You ask great questions! And I’ll answer that, on December 1st. In the meantime, if you don’t mind a spoiler or two, you can read what Pete Tzinski had to say about Ether. It’s an archetypal story, with a classic structure, of the sort you see in Narnia, Alice and Wonderland...to an extent…A Connecticut Yankee in King Arthur’s Court by Mark Twain, and so many other books. It’s a classic high fantasy story, of the sort that existed before Tolkien gave “high fantasy” a definition. And atop that, it’s also the classic “stranger in a strange land” sort of story. The man from our time, out of his time and place. A lazy person could call the characters clichés, but they aren’t. They’re archetypal characters too, classical characters who fit their mold and fulfill the function. They’re very much classical heroes out of mythology and world culture, and I think that helps to put Ether into the class of fairy tale, similar to what someone like Neil Gaiman was going for with Stardust, a classic (almost English) fairy tale, although I think that Daniel lends the story a certain Western/American sense that a British fairy tale wouldn’t have. Daniel is the classic hero, following the hero’s journey as laid out in things like Hero with a thousand faces by Joseph Campbell, who is thrown into a strange land and while initially seeking to get home is also growing as a human being into someone who can fulfill his great potential, and then placed in a situation in which he must recognize his potential and act upon it, or go back to his old life (which is not a choice at all, because he has been reshaped to that point so that he MUST act on his potential). Daniel does this, and he goes on to help Ian and the Princess serve justice. There is the romance between the Princess and Daniel, but that’s not the key part of the story that everything else hinges on. Daniel, having come into his own, must move to rescue the princess and aid her because…he must. It’s the character he is. Ian is the staunch ally, the loyal supporter. Not necessarily the sidekick, but he is the Unfurth to Beowulf, he is Chewbacca to Han Solo, he is Sam to Frodo, Spock AND McCoy to Kirk, in that they augment the hero character. A “sidekick” cannot function without the main character, not without serious evolution, which removes him from being a sidekick and makes him and augmenting character. That’s what Ian is. He provides clarity for Daniel, he provides knowledge and protection, and at the same time, it is his grim sense of loyalty and sense of justice — bitter though he might be after years of neglect — which help to awaken in Daniel the potential. The Princess is a classic story of someone who is outcast and must fight to reclaim their throne. She could have been the center of the story, if Daniel hadn’t been. She doesn’t exist to serve as the love interest, any more than Ian exists to serve as the sidekick. In many ways, she’s there to serve as a final catalyst, the final door through which Daniel must inevitably go in order to fulfill his potential and step onto the path that he has to follow. The world, the villains, are all unique creations, but they are the unique backdrop to a very classical, very old sort of story. You had me at the donkey. But you knew that, didn’t you? 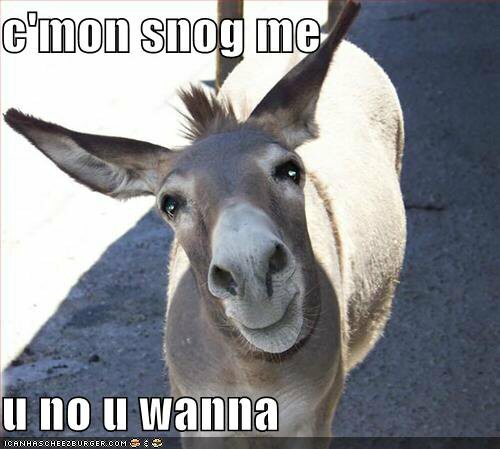 I would totally snog the donkey. He’s cute! And cool beans about the writing stuff. I,M certainly going to be buying it. Seriously looking forward to reading something else you’ve written.